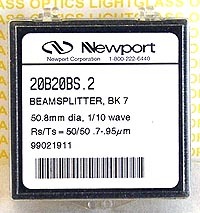 The 20B20BS.2 beamsplitter measures 50.8mm in dia. and is made of BK-7. It is accurate to 1/10th wave. The BS.2 Dielectric coatings are optimized for 700-950nm at a 45 degree angle of incidence. Reflectivity Rs =50% New in Factory packaging.